My Rackmount Server - Page 2 - Hardware - Covecube Inc.
That's a very nice setup! IF the Apple TV 3's are jailbroken (or at least capable of it), have you considered using XBMC on them? And maybe using mySQL on your server to sync their libraries? I had a jail broken AppleTV 2 and had a horrible experience with it. Lots of crashes with it and XBMC. I've gotten to a point that I want my devices to work and not have to work constantly to use them. My configuration works flawlessly with iHomeServer, which is key to running a large iTunes installation. I will admit that there was a initial learning curve but once you move past it there is very little up keep needed. Having all my media consolidated under iTunes is nice. I have all the iPads and iPhones doing nightly backups and a easy point to sync any movies, tv shows or music on them. Additionally it's a central location for having CrashPlan to backup my media. Stability is definitely an important thing. No good if you have to fight with it every five minutes. Though, I'm using XBMC on Windows, using AMD APU systems. That, .... and I avoid all things Apple when I can. I'm not a fan would be an understatement. But it looks like you have a solution that works very well and that you like. And there is a lot to be said about that. Any chance we can get some more setup's on here with pics it's nice to see what people have and is great info for those upgrading. 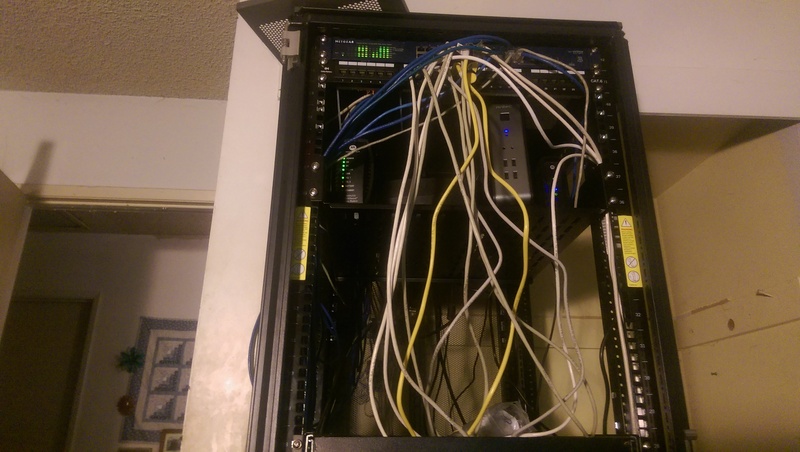 Since you asked, I'll add to the thread even though it is not a rack mount system. CPU - AMD Athlon II X4 610e, 45w TPD Had to upgrade last week, now is a Phenom II X6 1090T, more on that at the end of post. Cooler - I don't remember, I built this thing several years ago. It's huge and the giant fan is quiet. No, it's nothing special, but it works for what I'm running on it. And of course, DrivePool and Stablebit Scanner. BlueIris is quite the processor hog, even with everything optimized to be as efficient as possible. I was having some CPU overload issues when SabNZB went to unpack files, so I upgraded the processor. My plan in the near future is to build a second server, run ESXi, and start working with some of the open source data center tools. I have a long IT background, but moved into IT security audit about 3.5 years ago. My home stuff is the only thing that keeps me hands-on current. This server will get the 610e back, remain my disk space server, and will most likely keep BlueIris until I add so many cameras that it can't keep up. New server is going to be an i7 4790 based system on an ASRock Z87 Extreme6 board. Gobs of memory, ESXi, and solid state drive. I won't go into all the network gear, but it is all enterprise stuff - lots of APs (long 1954 ranch style house dictates it), Juniper gear throughout, etc. Cameras and some of the APs are PoE, you get the idea. have you considered a Xeon for a server im building mine with a Xeon 1246 V3 for 273.99 for the cpu and a gigabyte micro mobo for Ga-z97-Mx gaming 5 mobo with 3 pci 16 slots u can get that board and xeon chip for roughly 400..
also consider the fractal design Node 804 if you are willing to go micro atx .... this case can easily support 10 3.5 inch hdd 2 2.5 inch HDD and a slot load dvd drive. I own it and love it. Yeah, BlueIris is a CPU hog. Even without using HD cameras. I've found that it's better to run it on a dedicate system (or even in a VM...) to help curb it's CPU usage. As for the hardware, a Xeon and a server board (SuperMicro or ASRock RACK) may be a better buy. But that's personal preference. Yeah, that's why I am considering a second server with VMs. I've read a lot about the SuperMicro boards and machines. I used to use a lot of SuperMicro machines back when I was still in operations (I moved to Information Security, then to IS Audit a few years back) but haven't really considered them for home use. I know a bunch of the HTPC server backend guys use them. There are some fairly cheap rigs out there that would be great for BlueIris, I am just reluctant to throw such a good PC into service just for BlueIris. Yes, I can build one cheap enough but there are some pretty fantastic pre-built systems out there for around $500. Well, I have a supermicro X10SAT and am very happy with it. As for BlueIris, a core i3 could work, depending on what you're using for the cameras. Or by a barebone ThinkServe (lenovo/IBM) for cheap and set that up as a dedicated blueiris box. BlueIris recommends i7, I know in my case I'd kill an i3. I just received a 7th. I'm using an A8, I think and haven't been maxing the CPU at all. And the same with my Xeon (stats why is very similar to the i7-4770). However, I'm using the "Direct to disk" method and not converting the files (you can do that later). So it really depends on the number of cameras you're using, the quality and if you're transcoding the files). But yes, best bet is to overshoot on hardware, that way you have room to grow, if needed. I'm doing Direct to Disk too, it really helped. It definitely does. And you can "export" to different formats if needed. IIRC. 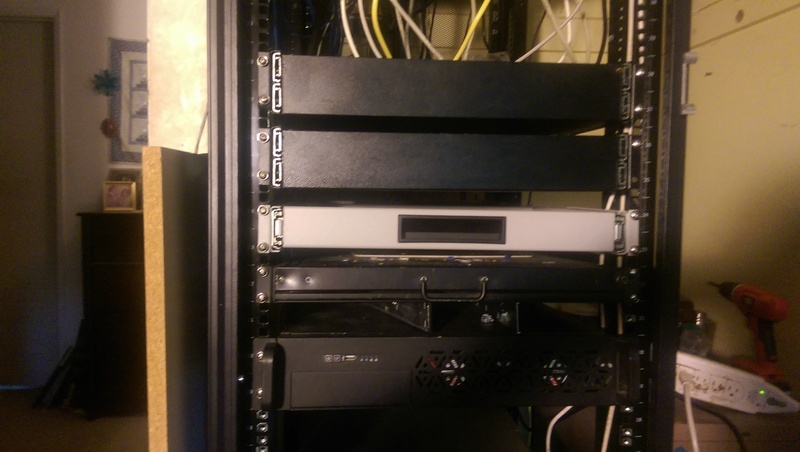 image.jpgHere is my configuration along with a custom built rack. quick ? are you running standard crashplan on ihomeserver? 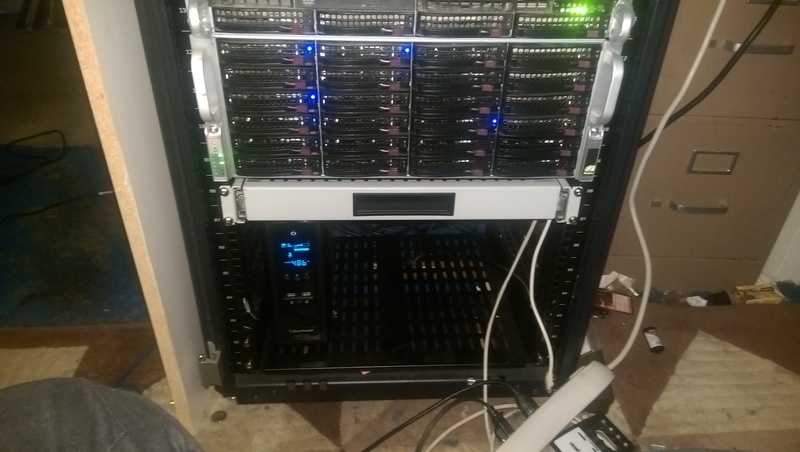 I built this system a couple weeks ago to replace a HP MediaSmart EX485 with 12 TB storage. 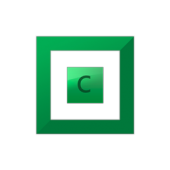 This is used to provide full client PC backups for 5 PCs, network storage for user files that need to sync across our desktop and notebook PCs, bulk file storage and media streaming (temporarily Mezzmo for DLNA but am migrating over to Plex Media Server). The biggest issue I've had so far was intermittent drive errors getting logged in Windows' Event Log. I finally got it resolved yesterday by disabling IntelliPark on the Red's using wdidle3. Stablebit Drivepool + Scanner to combine the 6x Reds into a single drive pool with selective folder duplication. And very nice upgrade. I'm sure the dual CPUs are serving you well in that setup! Nice compact build. I am also trying to keep a small box, I would post some pictures later. One question : what kind of disk events were logs? Because on my build I get 1 disk event 153 each time I reboot. I wonder if it is hardware relate or maybe Windows side or DriverPool side. The 153 event is a "retried" error. This may be harmless (it's rather normal, actually), and if you're only seeing it during boot, it may just be a timing issue with the drive controller. Check the disk number it mentions with Disk Management (run "diskmgmt.msc") and check which drive it is. EDIT : checked again and yes it is DrivePool disk. The error started after I did made a lot of firmware/bios/driver change for my IBM M1115, a lot of reboot, and now the error won't go away and appear each time the server is shut down or restarted. But no other issues so far. If that's the case, it may be "non critical" and may be an issue with how the controller is being handled. Worst case, enable boot logging and reboot the system. logs uploaded but I don't know if there is any info in the logs since the event 153 is recorded at shutdown, not when booting.